Drones are going to be practically everywhere before too long. Perhaps you’ve spotted a few yourself, making deliveries in your city or maybe doing laps across your local park while its pilot watches from a distant vantage point. There’s no way around it — drones are lots of fun! But the funny part is, while most of us are still saving our pennies for our own sky-patrolling aircraft, the next major step for drones is already happening … underwater. That’s right: underwater drones are finally coming of age. What’s the state of this technology? And which models are the right ones for developing your inner Captain Nemo? To find out, keep reading our complete guide to buying underwater drones! Drones tickle a nearly primeval desire in the human mind to explore and learn about our environment. Who wouldn’t want to elevate themselves to a bird’s-eye view of the world? This technology, ahem, took off in large part because of our insatiable curiosity. But consider how much less we know about the seas and oceans than we do about the skies and the clouds. Scientists with the National Ocean Service estimate that more than 95 percent of the earth’s oceans have so far gone unexplored. So is it any wonder why underwater drones are taking the consumer tech world by storm? We’re not saying you’re going to catch giant squids or discover new species on your days away from the office, but merely treating ourselves to a fleeting glimpse of this underwater kingdom is privilege enough for us land-dwellers — and an outlandish level of luxury that can surprisingly be relatively affordable. You'll likely remember the earliest airborne drones — they were little more than novelties or kids’ toys. Many of them still are. But in just a short while, we watched as this burgeoning technology matured to the point where amateur hobbyists can now fly aircraft that require oversight from the FAA. For a few hundred dollars, you can get a highly capable flying drone, spare batteries and propellers and just about everything else you need to get flying. Some of the underwater drones below require physical tethers because radio signals don’t travel well through water — this is a unique challenge airborne drones don’t have. Recording low-quality, compressed video to stream it wirelessly could make the whole endeavour kind of pointless. If video quality is your major concern — if you’re a filmmaker or a salvage operator, for example — tethers are going to be here for a while. Also, the cleanliness of the camera lenses and sensor apertures is something else to consider. If a drone is submerged beneath hundreds of feet of water, the whole operation has to grind to a halt while the operator retrieves the drone and attends to the problem. Naturally, some or all of these challenges apply to “regular” drones as well. They’re not tethered by a cable, but the range of our remotes and the finite lives of our lithium-based batteries still mean operating a drone comes with a limited operational window. Fishing and high technology don’t sound like an obvious match, but our first entry combines them for interesting results. That’s right — PowerVision’s PowerRay is a drone for fishermen. Sensors and sonar equipment aboard the drone can feed you all kinds of data points, including the temperature of the water, what the submarine landscape looks like and whether there are any fish about. A high-powered camera can record video in 4K or stills at 12 megapixels. 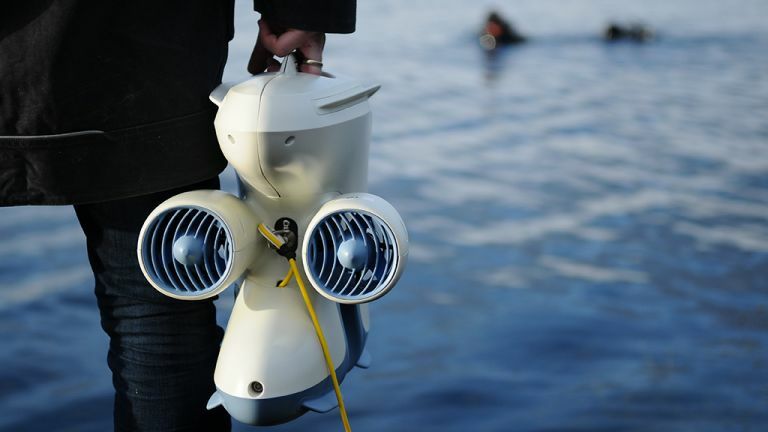 Blueye is an underwater drone developed in Norway — home of striking coastlines and a hotbed of nautical research. Pioneer is billing Blueye as the “world’s finest” undersea drone for exploration purposes. The drone can reach depths of up to 150 meters, uses Wi-Fi connectivity and offers two hours of battery life. Using your VR goggles or any conventional mobile device, Blueye is easy to control and offers nearly seamless uploads of stills and video (30 fps, 1080p) to your favourite social networks. Pioneer is offering a 15 percent discount off the anticipated sticker price of $3,550 when you purchase through their website. The drone goes on sale in 2018. Believe it or not, drones developed by Deep Trekker have been used in underwater search and rescue tasks for years. These are definitely not toys! The Starter model has a 50-meter tether and a depth rating of 100 meters. The Pro model has a 75-meter tether and a depth rating of 100 meters. The Smart model can dive to 150 meters on a 75-meter tether. The Worker model has a 100-meter tether, grabber arms, “intelligent” sensors, auto-depth features and more. The Starter model carries a price of $3,899 and is available now. The Worker model will set you back almost 10 grand, but this model won’t likely appeal to you unless your line of work concerns undersea retrieval, maintenance or something similar. It looks like something out of a James Cameron film! And now for something just a little bit different. The iBubble Camera is perhaps unique — it’s a hands-free, entirely autonomous drone that will follow you as you swim and dive, recording high-quality video the whole while. The unit has a 196-meter max dive depth and can run for a solid hour. It also comes with a bracelet so you can adjust the drone’s film modes and angles without a lot of fuss. An optional tether extends the reach of iBubble and makes it suitable for more ambitious exploration. You can pre-order iBubble on IndieGoGo for a discounted price of $1,999. The anticipated shipping window is summer 2018.